Some photos from a trip to Manhattan New York on Sept 10, 2011 on the dock. The main reason I was there was to testify as a character witness in the trial of James Fleishman, but in the end I was not called on by the defense and so I never testified. While I was waiting to find this out I wandered about New York with Katherine, below are some random pictures. Click on any picture for a REALLY HUGE original version. Katherine and I actually missed our original flight by 2 minutes, and they put us in first class on the following flight. 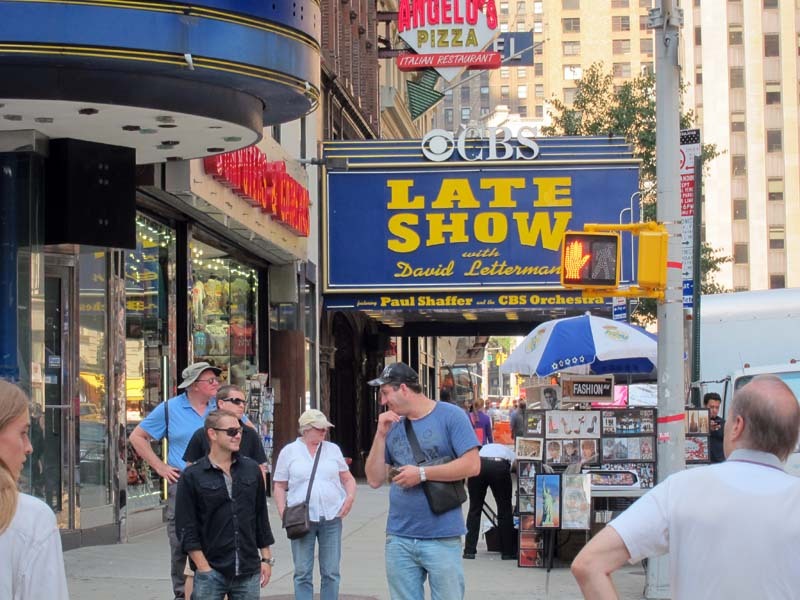 Click Here for a Google Map of some locations in New York we visited during the trip, and the picture below shows those locations also. We stayed at the Sheraton New York Hotel & Towers in Manhattan at the corner of 53rd and 7th street, Manhattan, New York. 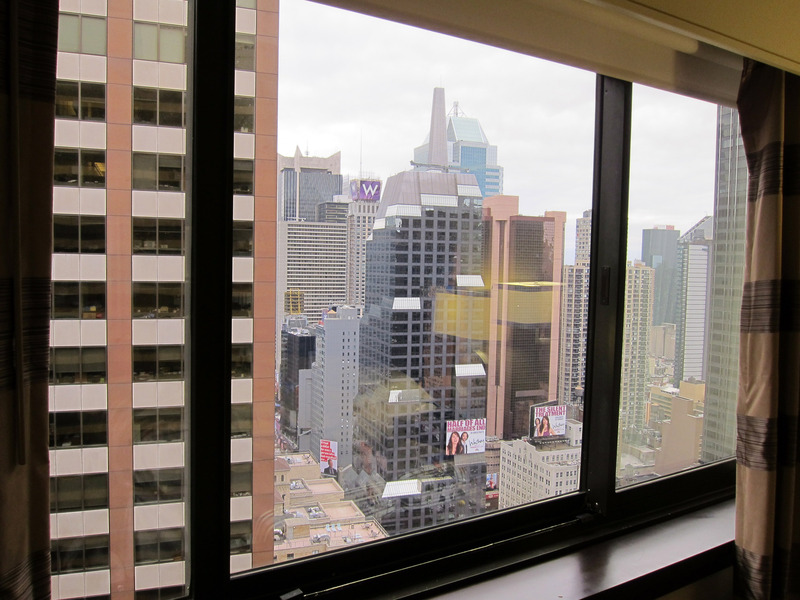 Below is the view from our room on the 43rd floor. 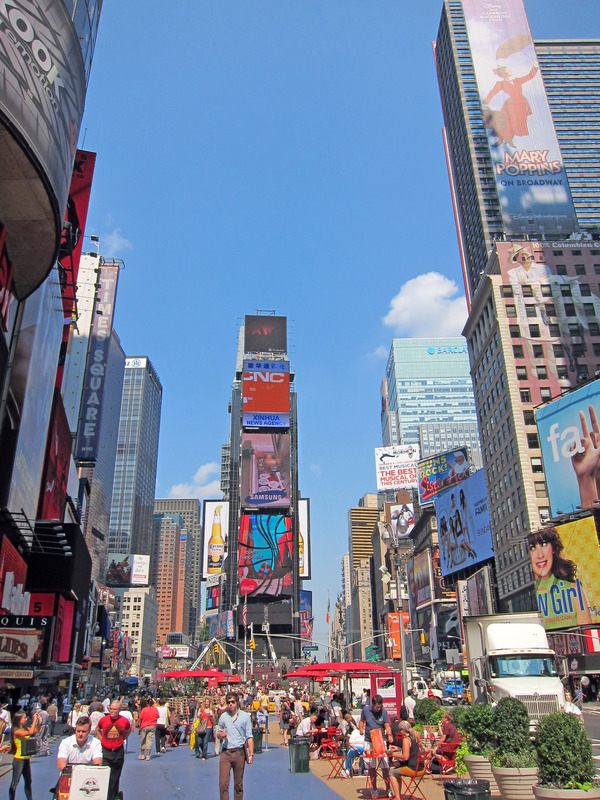 It is kind of looking towards Times Square (past the purple "W") around to the left. Ever since my first taxi ride in New York years ago, I get a thrill out of the poetic fighter pilot madness of taxi rides in New York. If you haven't done it, it is like an amusement park ride where the drivers will hit speeds of 50 and 60 mph if the opportunity arises, then brake like madmen, and they squeeze around each other and barely miss each other and "honk" lightly letting each other know what is going on. There are moments where you are surrounded by yellow taxis on main thoroughfares, then moments where you are hurtling down some side street at 50 mph with no visibility. At first I thought it was all random insanity and I was going to die, but these guys are (mostly) amazing professionals doing a tough, high stress job and they have it under control and know what they are doing. 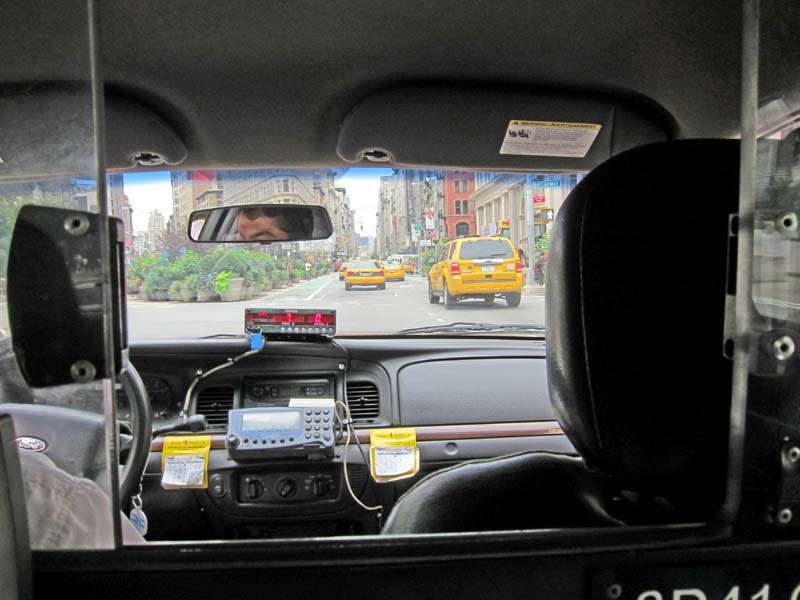 You won't see a New York city taxi driver calmly sipping a latte or reading the paper as he drives, like you might in San Francisco. Here the driver is heads up gripping the steering wheel with both hands with a foot on the brake and the other foot on the accelerator and one of the two is ALWAYS hammered all the way to the floor. Life or death is a difference of 2 seconds reaction time, and yet I've *NEVER* seen a taxi touch another car or another taxi, while coming within 6 inches of other vehicles on practically every taxi ride. 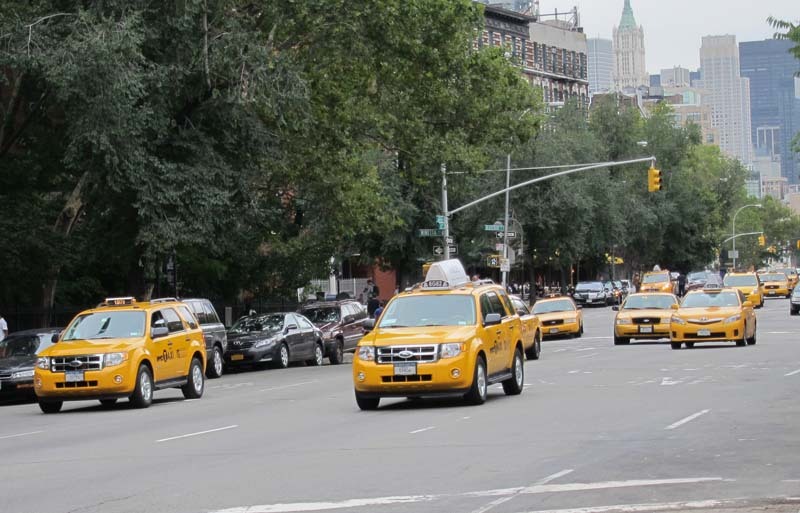 Below is a picture as we bomb down this Manhattan street at 50 mph crossing through intersections and surrounded by other taxis. 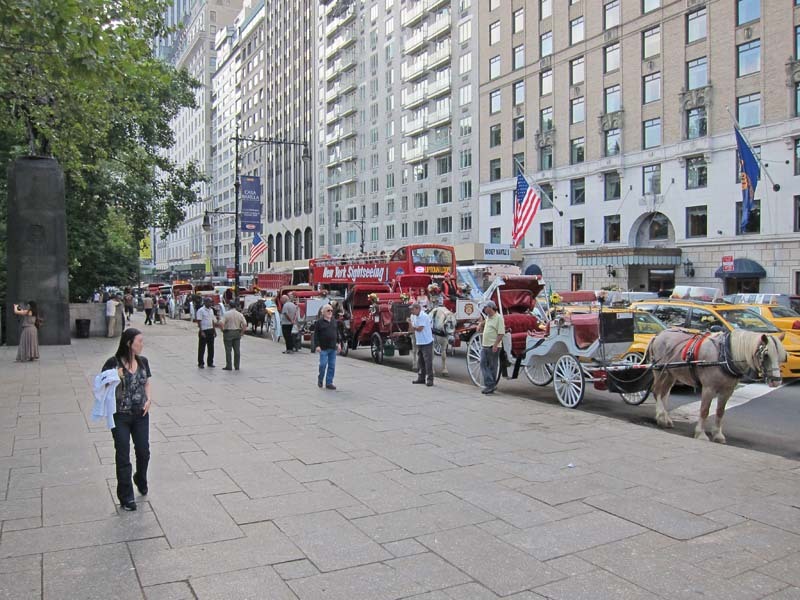 In New York (Manhattan), the taxis own the roads and there are more taxis than cars driving around. 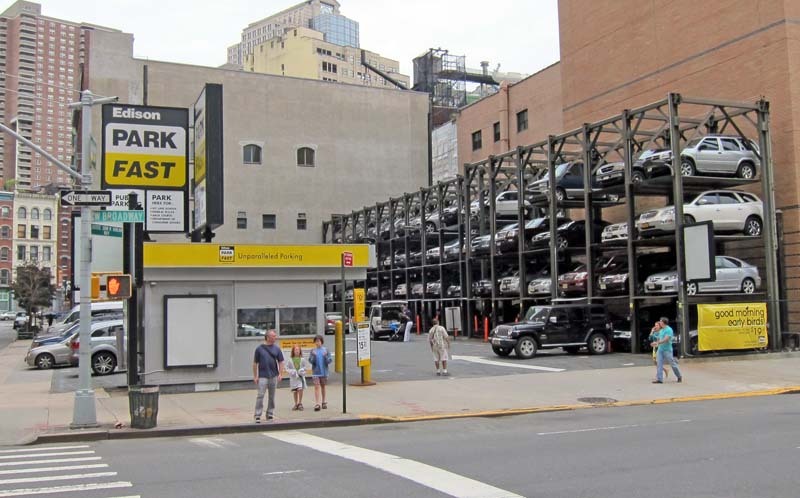 See a picture of a common street below filled with taxi's and zero privately owned cars (some private cars are parked by the side of the road, but none are moving). It just so happened we were in New York on the 10th anniversary of the 9/11 terrorist attacks that destroyed the World Trade Center. The building with cranes on the top in the picture below is "One World Trade Center" and will eventually be 105 stories tall. They were only letting families of the victims approach during the 10th anniversary. 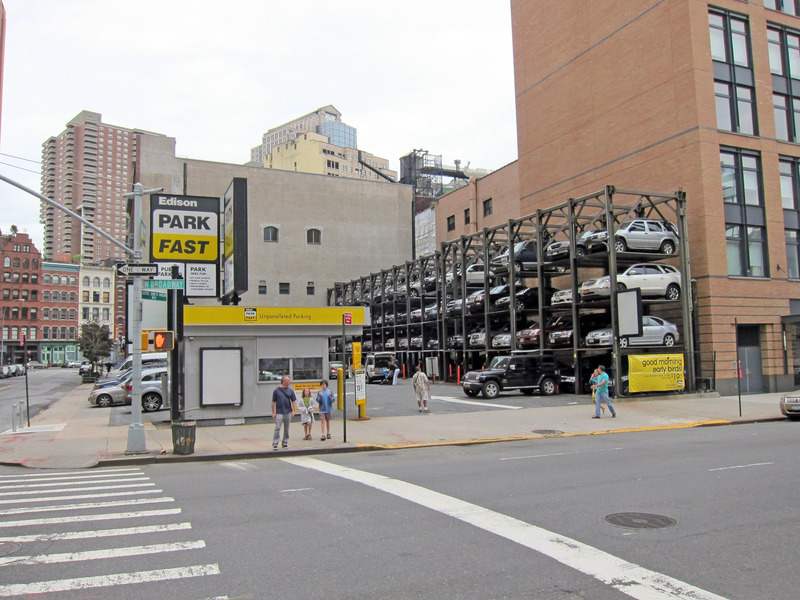 I saw these parking lot "car lifts" like the ones pictured below all over Manhattan. I had heard of these a few years ago in Japan, this is the first I have seen one. We desperately need these in San Francisco, but unlike New York, San Francisco struggles with the most basic infrastructure needs. Heck, my *OFFICE* would benefit massively from this in our very own parking lot, we can never find parking in San Mateo. We searched out a very specific food dish (seen near Katherine's right elbow) which is onions on noodles. It is only found in certain Chinese restaurants that are influenced by Korean food. It is called It is called "Jajangmyeon" (It is spelled either 자장면 or 짜장면 in Korean.) http://en.wikipedia.org/wiki/Jajangmyeon The yellow dish on the far right of the picture (near Katherine's left elbow) is is "Takuan" and is a traditional sweet-ish daikon pickle served along with raw white onions and black bean dipping sauce. http://en.wikipedia.org/wiki/Takuan In the far lower right corner is the requisite "Kimchee" (spiced cabbage) present at most Korean meals. In the lower left of the picture is a dish I ordered to hedge my bets if I didn't like the Jajangmyeon. The dish is "Tangsuyuk" (Korean: 탕수육). Tangsuyuk (Korean: 탕수육, Chinese: 糖水肉), the Koreanized version of sweet and sour pork or orange chicken. Unlike the Americanized Chinese dish of the same name, tangsuyuk can be made with either pork or beef. If the meat is replaced with shrimp, the dish is called tangsu saeu. 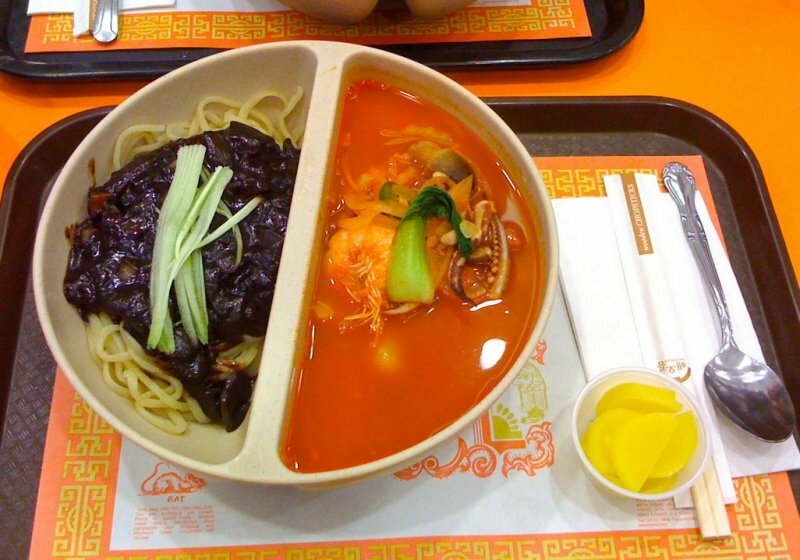 Most Koreans seek out either jajangmyeon or the spicy soup counterpart "Jjamppong" (Korean: 짬뽕). http://en.wikipedia.org/wiki/Jjamppong And in some restaurants, you can order a split bowl of the two types of noodles. Below is a picture I copied off the internet (not my photo). 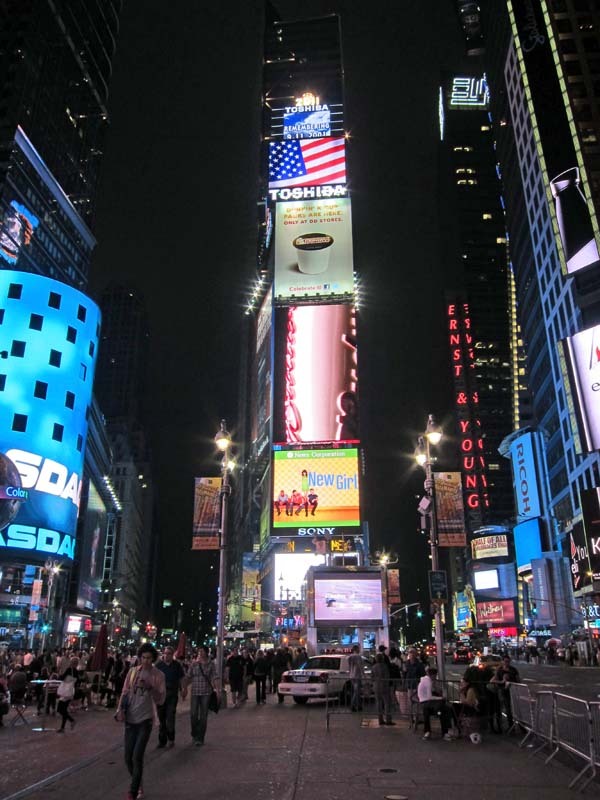 Below is a picture I took in Times Square, New York, almost midnight, Sept 11, 2011. 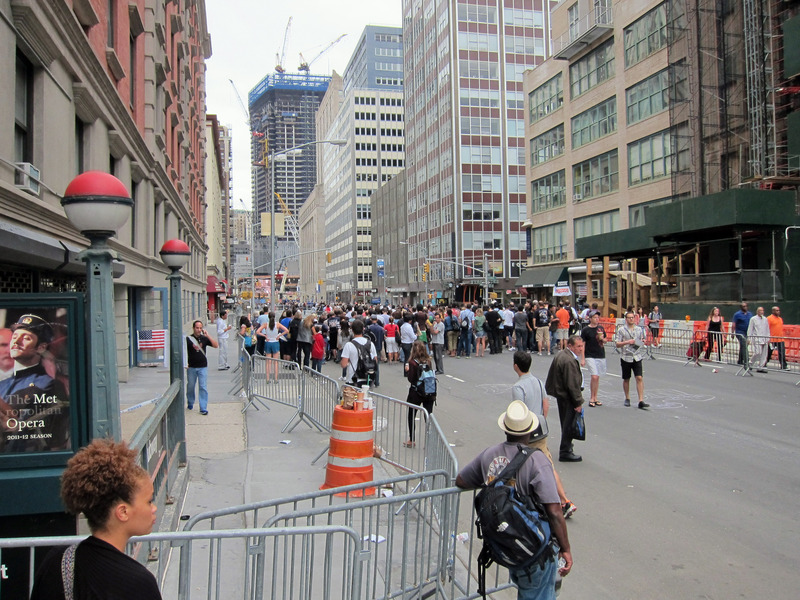 (They won't let non-family into ground zero, I figured Times Square is another place I could go to be with people.) It's been 10 years. I visited ground zero with Pavni (9 ?) years ago sooner after the fateful day. It was still a wreck back then, life is much more back to normal here now. I can't tell if it is sad, a blessing, or humanity's curse that our memories come to accept and then eventually forget how we feel about serious tragedies. Does that mean we are doomed to repeat them? 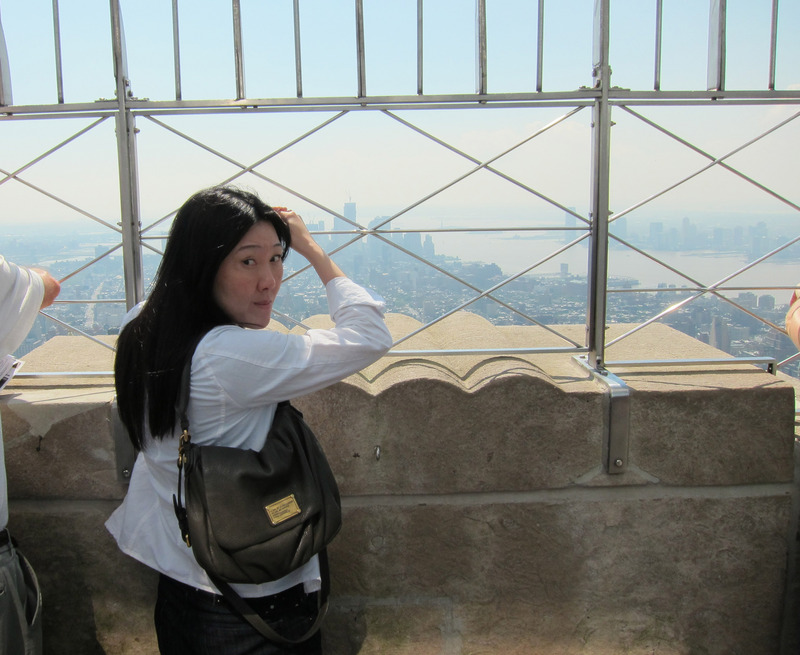 On September 12th, I wasn't required for the trial, so Katherine and I wandered about New York doing touristy stuff. 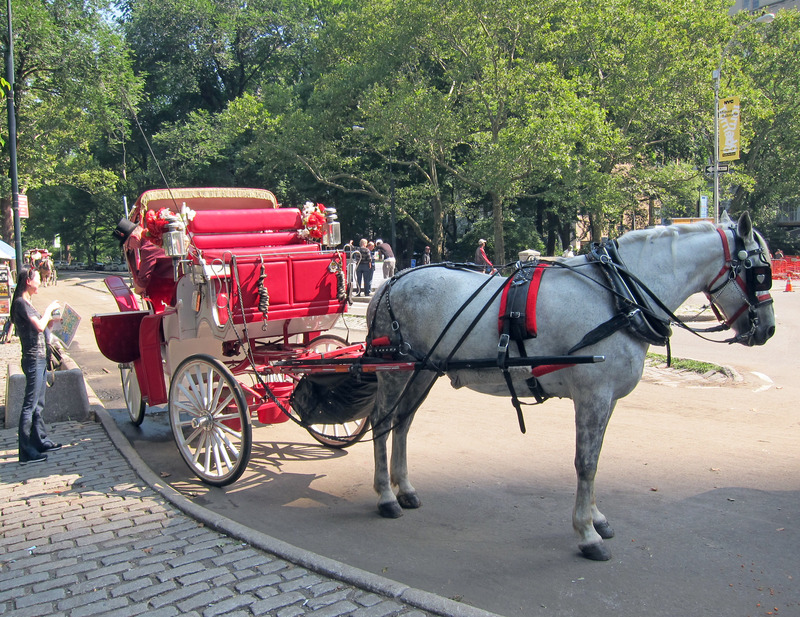 We went on a horse drawn carriage ride in Central Park, Manhattan, New York. Below we are choosing our carriage. 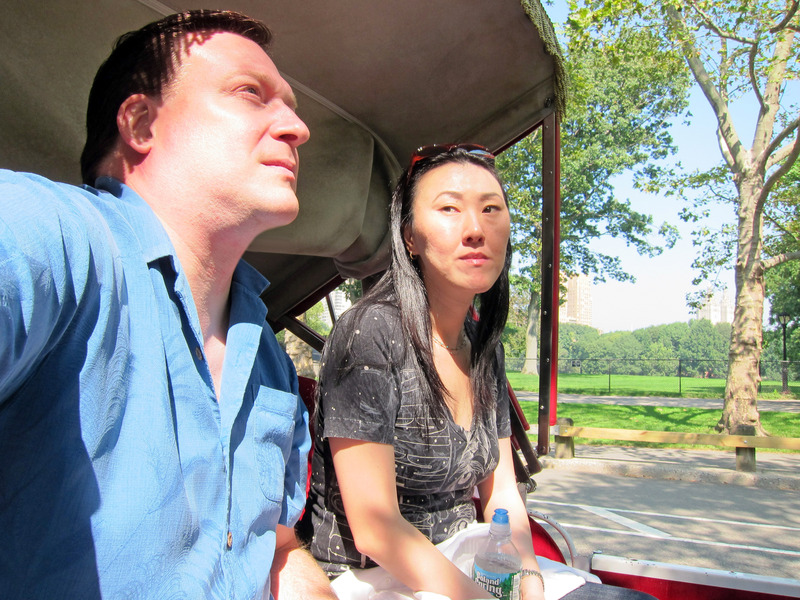 We decided on this carriage, and I can't remember the driver's name for sure, maybe Brandon? A super nice guy who has done this job for years, still friendly and helpful and didn't make us feel silly or touristy for taking the ride. You can see Brandon getting out of the carriage in the top hat. 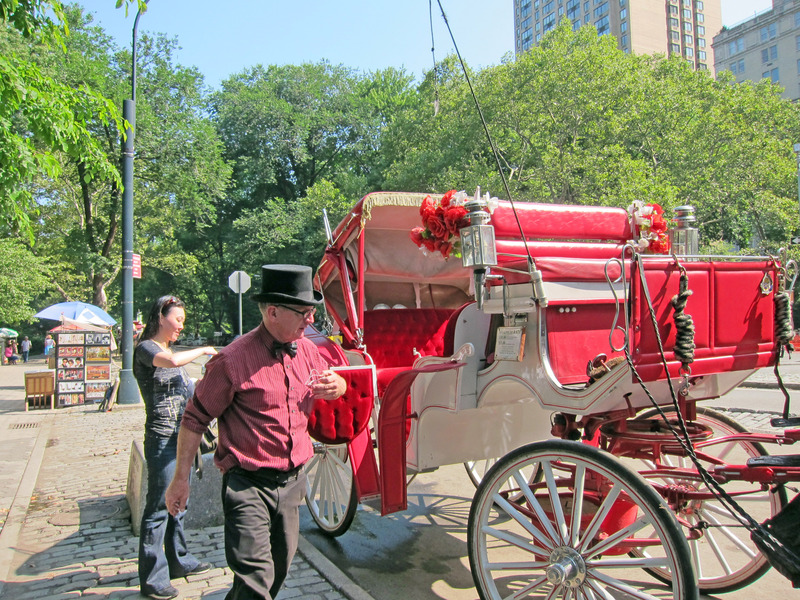 Brandon (our driver) getting things ready for our 45 minute ride through Central Park, Manhattan in a horse drawn carriage. Our view of Brandon for most of the ride. I like the huge buildings on the left in this picture. 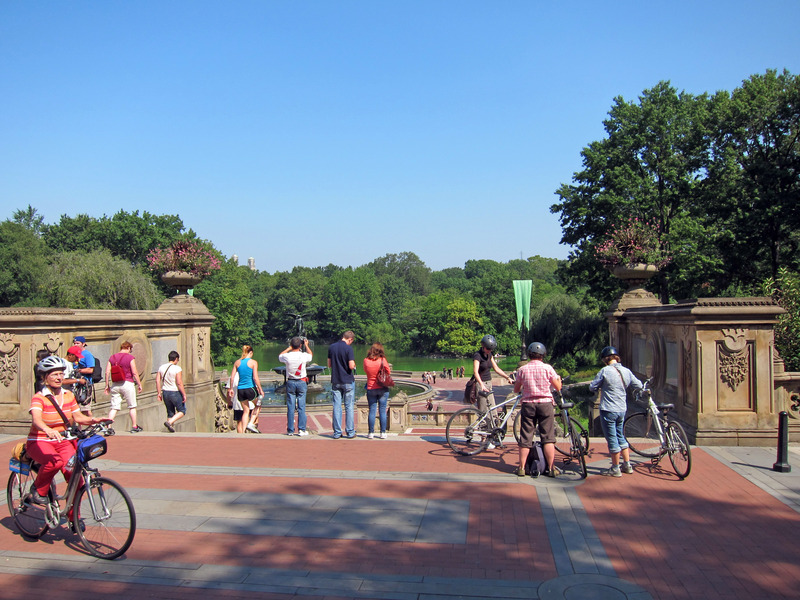 Below our carriage passes by the Bethesda Terrace in Central Park, and you can see the "Angel of the Waters" statue in the big fountain. 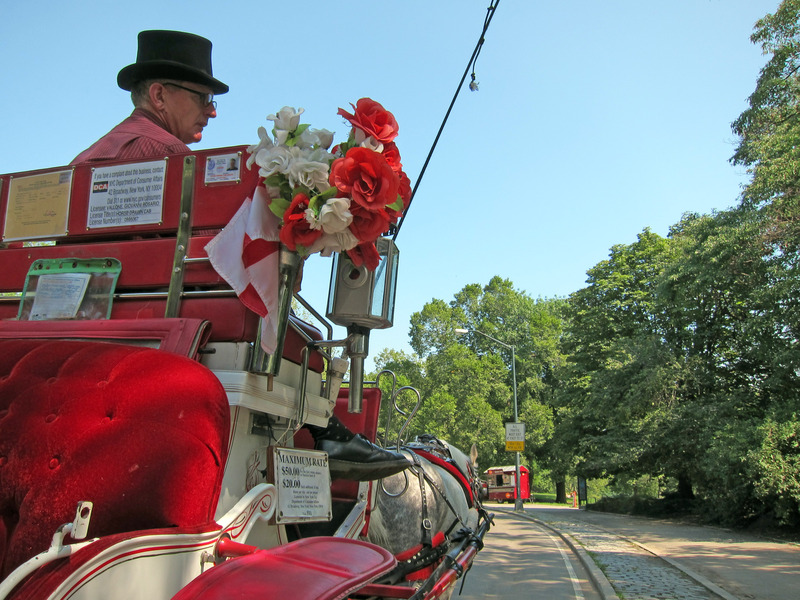 A picture of the side of the carriage as we saunter along. 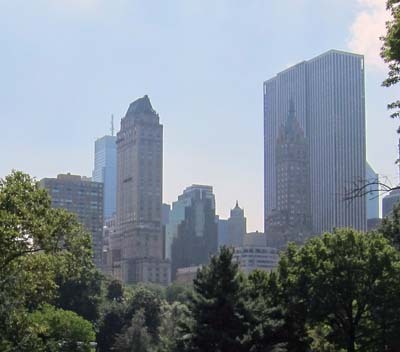 I like the picture below showing the massive technology of the sky scrapers just a little bit away from the park. 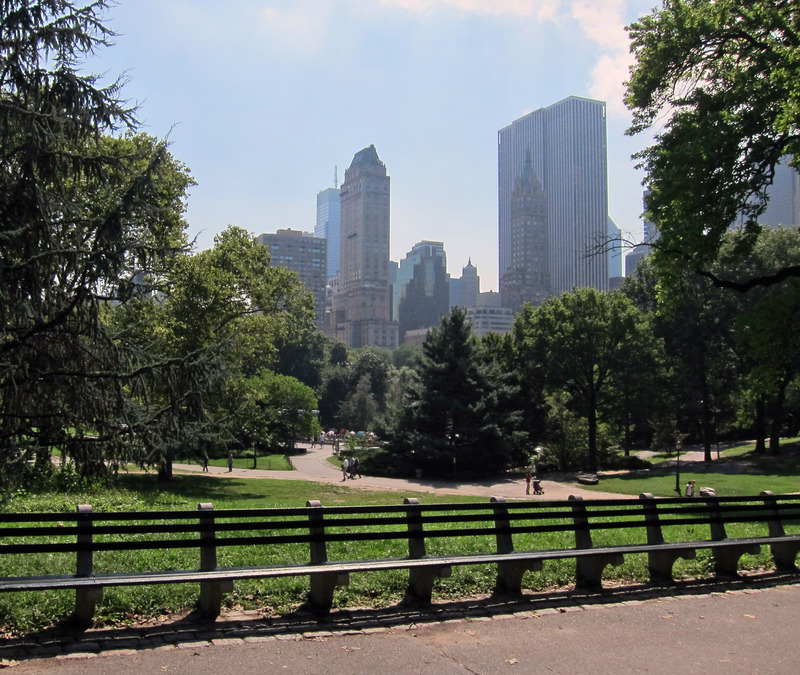 The picture below isn't on the carriage ride, it is just a panorama showing a little walk in Central Park, Manhattan, New York. 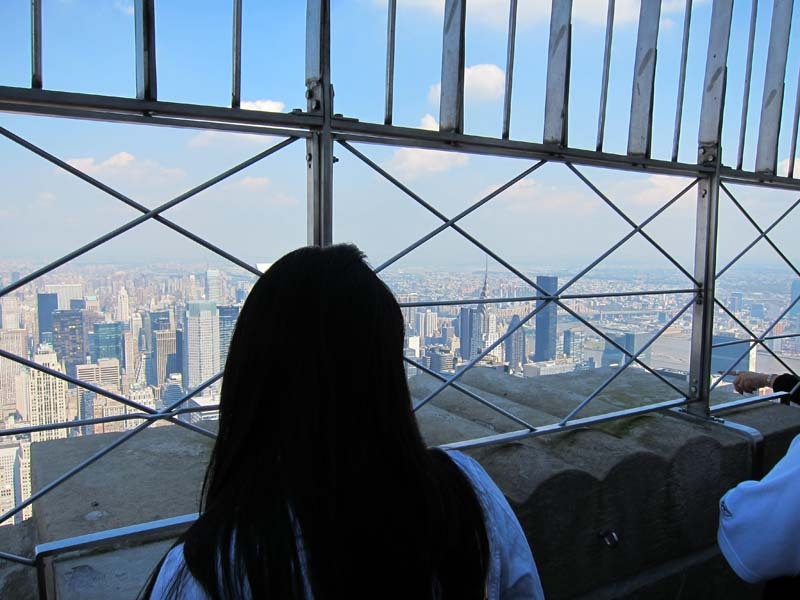 Later that day we went up in the Empire State Building in Manhattan, New York. In the picture below past Katherine is the southern tip of Manhattan and the world trade center location is just over her right wrist. At this moment (Sept 12, 2011) we are standing in the very tallest building left in New York, but the new "One World Trade Center" will be taller in a few months when it is complete. Below Katherine is looking at the Chrysler Building (the art deco looking thing with a pointy top directly to the right of Katherine's head). 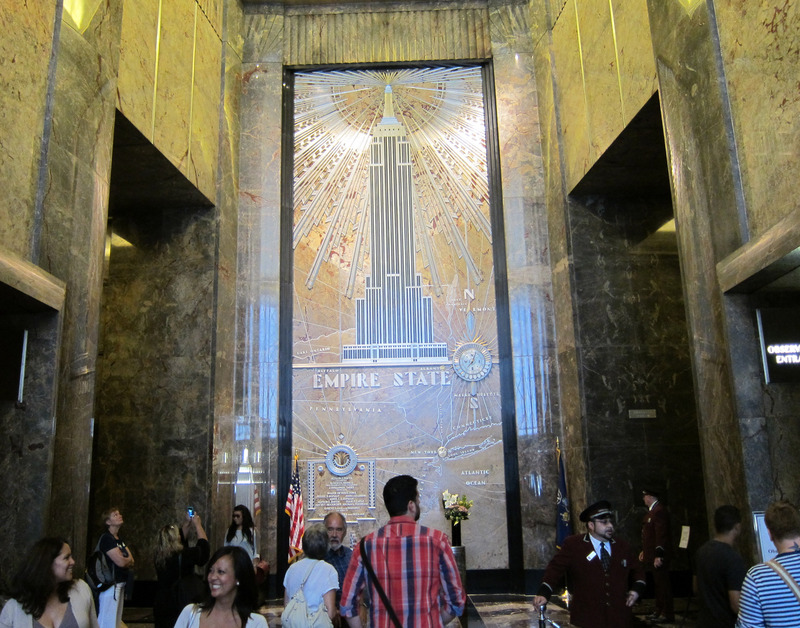 A picture of the lobby of the Empire State Building. 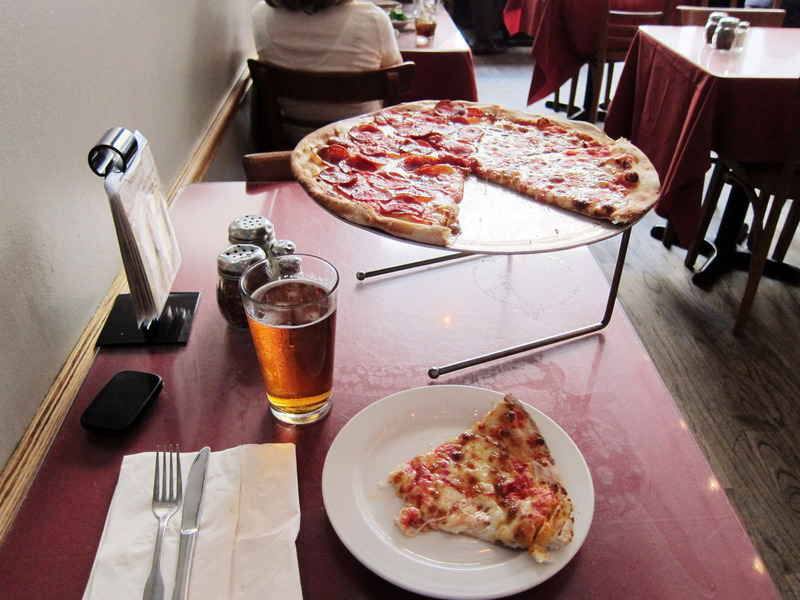 New York is famous for "pizza", so we found a fairly well recommended pizza place called "Rubirosa's Pizza" to complete our day of touristy New York things. 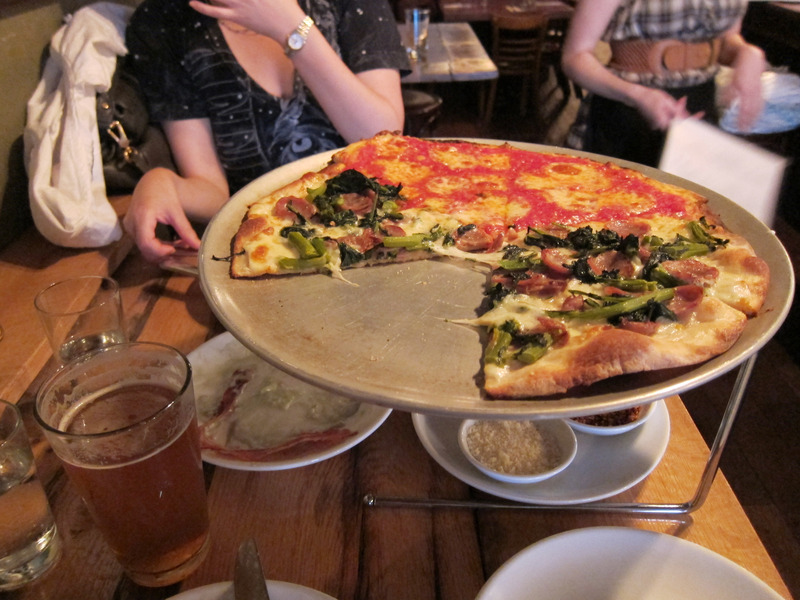 :-) The "thin crust with only cheese" half seen below is a "classic" New York pizza. It was very good. Wandering about, we walked through Times Square in the daylight. After Katherine left to go back home, I was delayed for a few more days waiting to testify. For food, I went to a little pizza place not far from my hotel that was recommended. This one was called "John's Pizza" and a picture is seen below. Again, quite good! 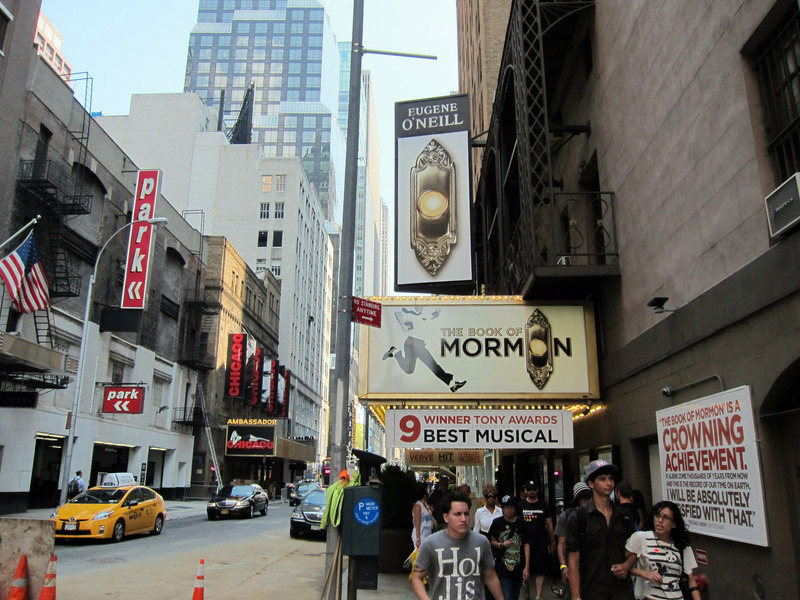 Several people (like Ramey) called me or emailed me while I was in New York to suggest I go see "The Book of Mormon" broadway play. Below is a picture of the entrance, but I chose not to attend. Not far from my hotel, the "Late Show with David Letterman" is filmed in the Ed Sullivan Theater. I didn't realize it was filmed in this area, I should have gotten tickets! This is a very random picture. 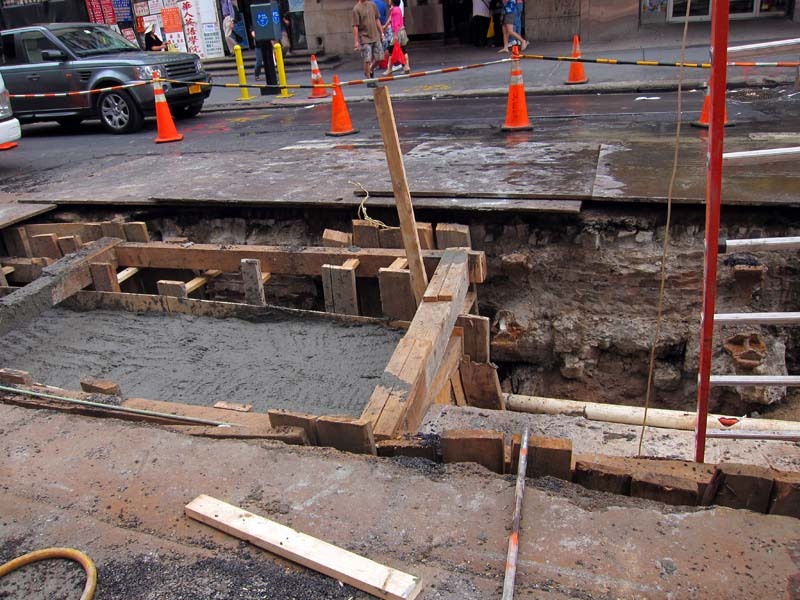 The street was torn up, and you can see some REALLY interesting brick work going all the way down 8 feet under the street. I have no idea what this means, or why there would be bricks INSIDE the Manhattan street for 8 feet down? After not testifying in the trial, I watched one hour of the trial then got the heck out of New York City to get back home to the San Francisco area. 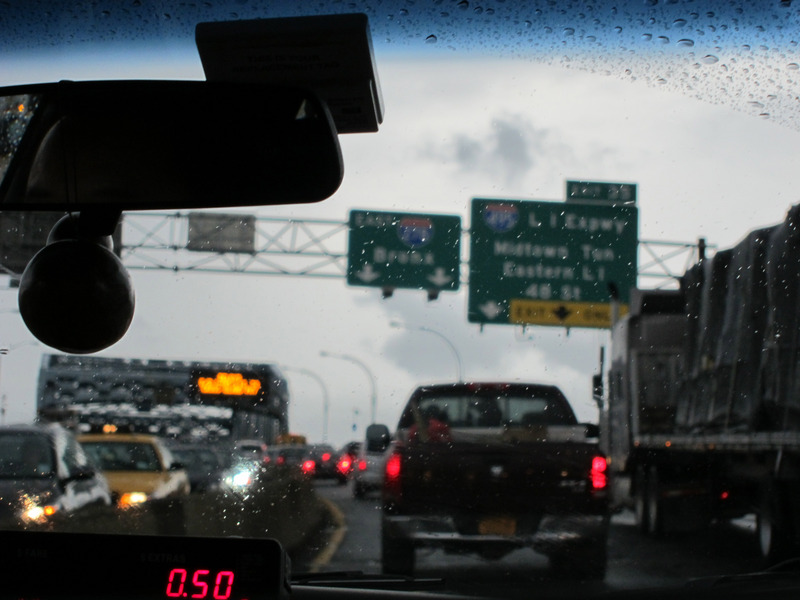 It took me 30 minutes to catch a cab in the rain, which almost made me late for my flight and I really was getting homesick and just wanted to get home. I asked a police officer directing traffic where to catch a cab, and he forced a cab to stop to accept me and take me to the airport. He tried to stop several cabs and finally stood in front of one and practically drew his gun to get the guy to take me to the airport! There was some yelling involved, I think the cop threatened to arrest the cab driver and impound the taxi. There was some disagreement over whether the cab driver had his "Off Duty" lights set correctly and whether or not he was legally obligated to pick me up. 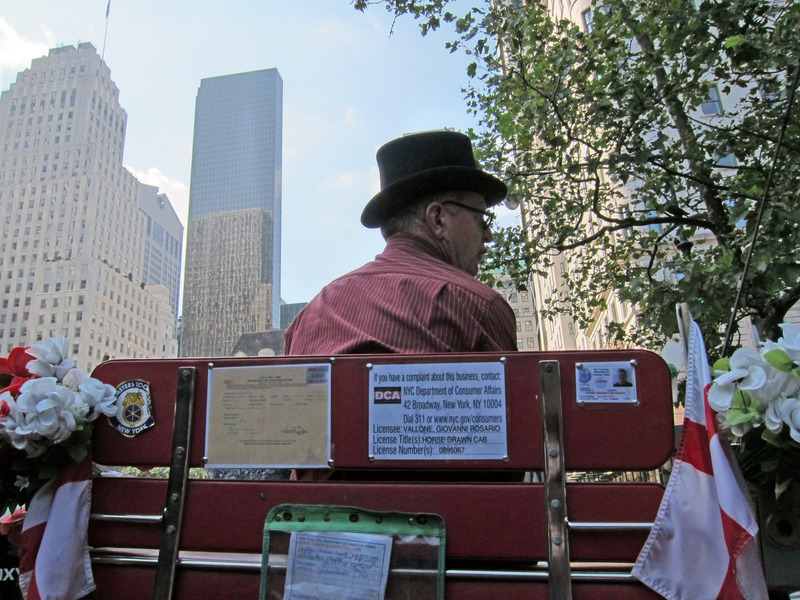 You know, I had nothing but good experiences with New York street cops on this trip, probably just a fluke or maybe they were being nice to tourists on the Sept 11 anniversary. Below I'm riding in the cab towards JFK airport. 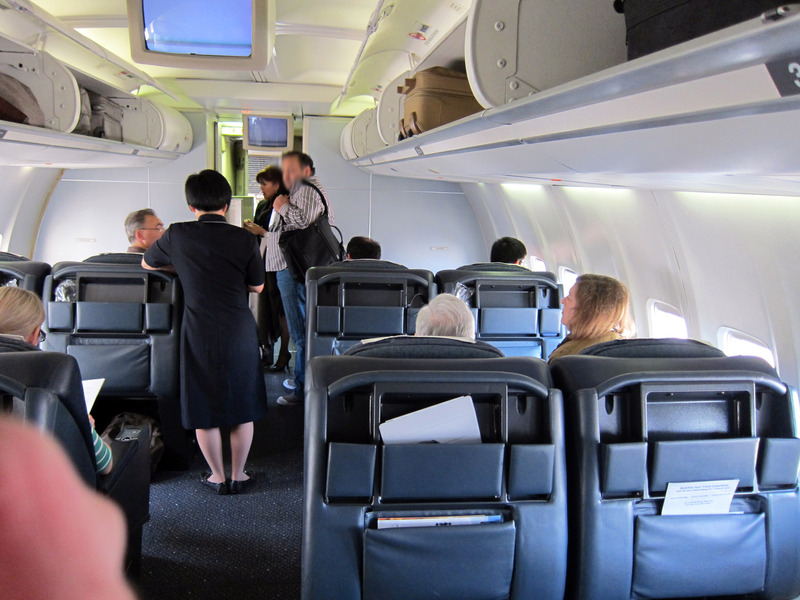 I made my flight! 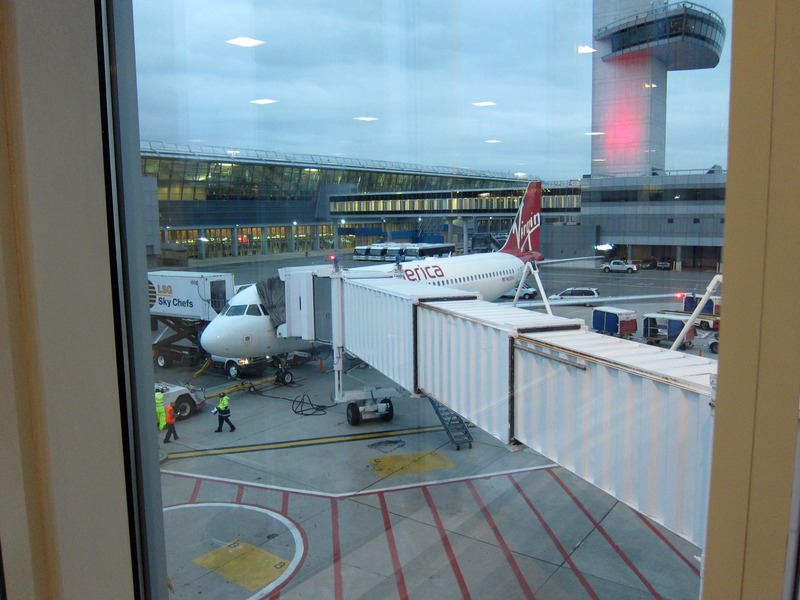 United Airlines was full, so I had to change over to Virgin flight on the way home. Virgin is NICE! 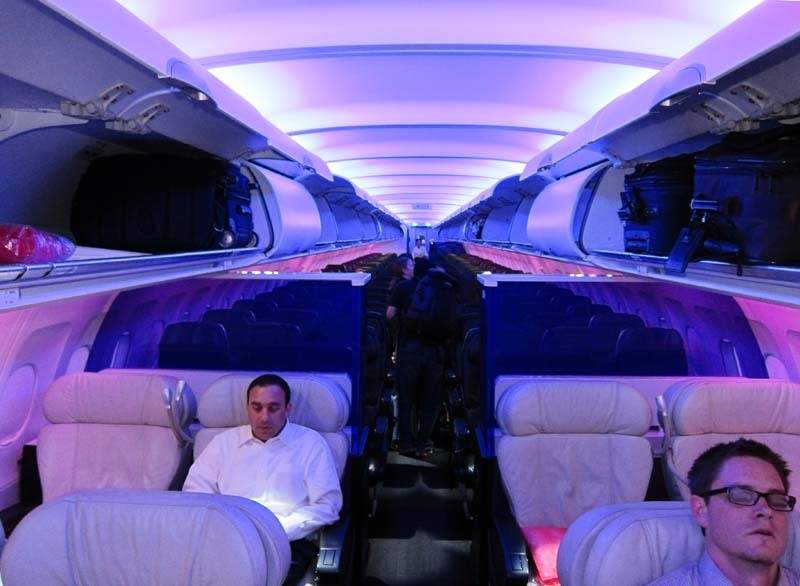 United is really sliding downhill, Virgin is up and coming nice.